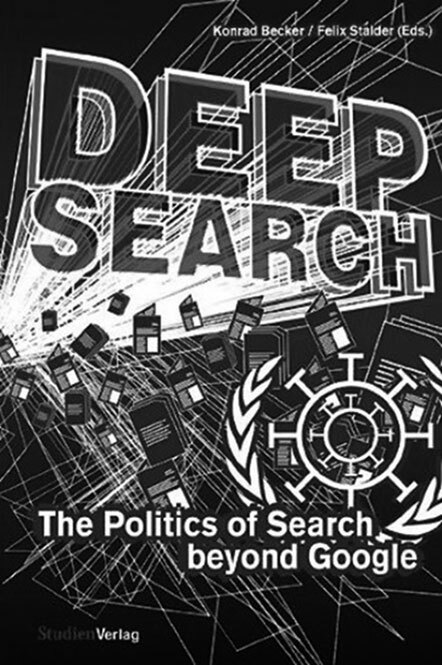 In November of 2009, the important conference ‘Search of the Query’, organized by the Institute of Network Cultures, took place in Amsterdam, where Konrad Becker, cofounder of the World Information Institute in Vienna, presented Deep Search: The Politics of Search Beyond Google, a collection of essays compiled by Felix Stalder and himself, which had just rolled off the press. This book, the result of a similarly named conference previously held in Vienna, is divided into four sections, ‘Histories’, ‘Liberties’, ‘Power’ and ‘Visibility’, that go deeper into various aspects of the ubiquitous and monumental presence of search engines. We have all become accustomed in our daily lives to using Google, which holds a unique position as the most frequently used search machine on the Internet. Neither the economic crisis nor the company’s clashes with the leaders of China changes a thing about this. The search machine has become an indispensable social phenomenon in a global information society where cost-cutting nation-states are no longer so willing or able to bear the responsibility of providing free information for their subjects. Paying for education as well as managing libraries and heritage and keeping them up to date has become an almost prohibitively expensive job, partly because of the enormous quantitative expansion of available information. But we must also bend our minds to the complex and sweeping transformation of a linear, centrally organized book culture into a strictly horizontal, widely distributed digital culture. People often sigh that free access to information and knowledge has become problematic due to the intervention and monopoly of commercial companies like Google. In the politics of the search command, is there still an alternative beyond the services that Google ostensibly offers for ‘free’? Google is expanding its services almost by the week, such as its recent project to make millions of books freely available online. Not only is the business monopoly position of the Google success story cause for concern, but also the fact that it has become so dominant that it is hardly possible to think of the generic, intellectual or private use of the Google search machine and the company’s specific business practices as a conceptual totality anymore. In this connection, we must look to the long awaited book by Siva Vaidhyanathan, The Googlization of Everything, which is coming out shortly. Unfortunately, the author is not represented in the Deep Search compilation, but he did give a presentation on this interesting project at the ‘Search of the Query’ conference. His anticipation of the Googlization of our lives arises from the worrying conclusion that the searching for and finding of information, as well as issues concerning the cultural and political aspects of the classification of information, deserves a much more fundamental and deeper discussion than the business model of a single company, which in all of its actions simply strives to maximize profits and therefore does everything in its power to be able to ‘read’ the end-user who is typing in the search command. In various critical essays by, among others, Geert Lovink, Lev Manovich, Richard Rogers, Metahaven, Matteo Pasquinelli, Konrad Becker and Felix Stalder / Christine Mayer, Deep Search not only draws attention to these and other problems concerning the supplying and finding of information. The book also focuses on long-term issues and the political ramifications they bring with them. For in the arena of search commands and search machines, the rapidity with which technologies, distribution forms and user forms are changing is merely a signal that the development of the technological information complex is by no means finished. One can even question whether the transformational state in which the Internet, as the new standard of our information supply, has found itself for more than a decade is not an inherent condition of its architecture. Since time immemorial, technological developments have laid the groundwork in the search for, storage and organizing of knowledge and information. Thus, it is only logical that we also examine both the past’s analogue and the present’s digital manner of looking up information from an evolutionary perspective. Deep Search accordingly focuses on both the technological dimensions of this change in our information supply and the social and cultural aspects that underlie the construction of information and knowledge. All of the essays in the book share the fundamental insight that the context, culture and classification of information systems are determining factors for how individuals and collectives discover and experience the world. As a ‘mass medium’ and as a relatively new technology in the network society, the search machine is gaining an increasingly critical and defining role whereby its effect on politics and the economy will surpass that of the conventional news sector and of the old mass media. Geert Lovink, media theorist and director of the Institute of Network Cultures, refers to MIT professor and computer critic Joseph Weizenbaum (1923–2008) in his essay. Weizenbaum was not only a prophetic computer academic, but also an early critic of the limitations of artificial intelligence, who even argued for a separate ethics for that field. Lovink cites Weizenbaum in order to examine critically the difference between ‘deciding’ and ‘choosing’ in the light of the logic of the search machine. Computers cannot choose; this is a process that can only be a human affair because it requires moral awareness and judgment. A simple notion perhaps, but a valuable qualification of the far-reaching computerization and mechanization of society. Deep Search marks an important Wende in Internet criticism, and can be considered a pioneering contribution to a research terrain that, parallel to a further politicization of our dealings with technology, will only increase in importance in the coming years.